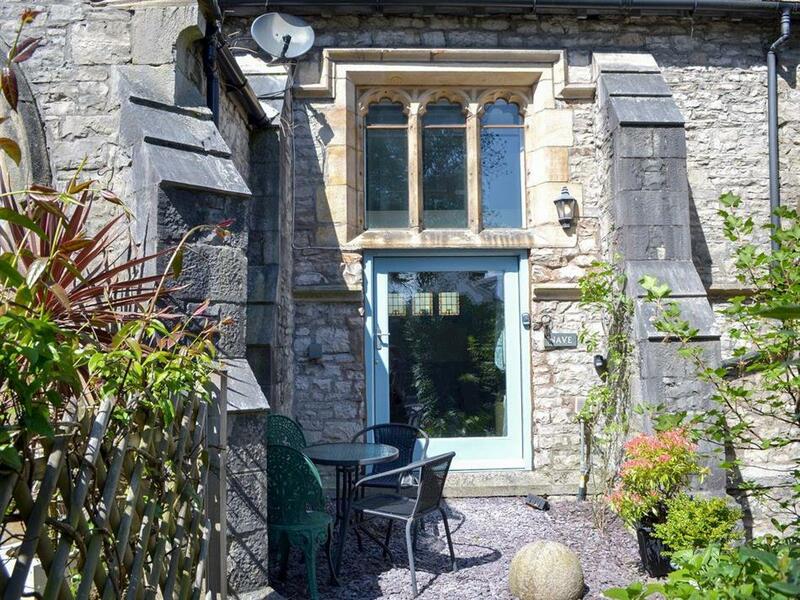 All Hallows Nave House in Kendal, Cumbria sleeps 4 people. All Hallows Nave House in Kendal is a unique architecturally re-designed church in the very heart of Kendal. All Hallows Nave House was originally a church and was built in 1864, and in 2002 it was converted into three houses. Whilst built to a very high specification and design, the original church stone mullioned feature stained glass window and beams give it great charm and appeal. The open-tread staircase with glass panels give a light and contemporary feel which complements the history and original features this beautiful home has to offer. On the ground floor is a well-equipped kitchen/dining room as well as a shower room. At one end of the room is a beautiful stained glass window which extends up to the first floor mezzanine, which is home to the main living area as well as a single bedroom. The main bathroom and a double bedroom are on the second floor, and on the third floor you will find another single bedroom which is accessed by a paddle staircase. Outside there is a small courtyard with garden furniture for you to enjoy the summer sun. 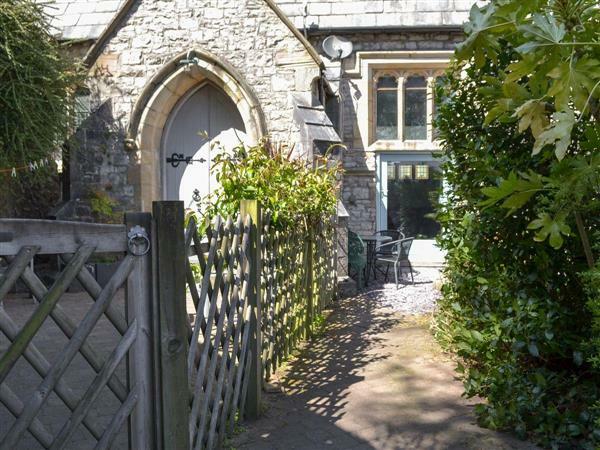 All Hallows Nave House is just a few minutes’ walk from the centre of Kendal, which is one of the Lake District’s most popular market towns. In addition to the wide variety of shops and supermarkets there is also The Brewery Arts Centre, two museums and an art gallery, so there is something for everyone. If you enjoy eating out, you will be spoilt for choice with the many cosy tea rooms, cafés, fine dining restaurants and traditional country pubs. Explore Windermere, Ambleside or Bowness and visit attractions such as the steam railway, the Lakes Aquarium and the World of Beatrix Potter. The shop is 100 yards from All Hallows Nave House in Kendal, with the pub and restaurant 200 yards from All Hallows Nave House. Ground Floor: Step to entrance. Kitchen/dining room: With electric oven, gas hob, microwave, fridge, freezer, dishwasher, beams and wooden floor. Shower room: With shower cubicle, toilet and washing machine. First Floor: Living room: Galleried with 28 Freeview TV, DVD player, beams and wooden floor. Second Floor: Bedroom 2: With double bed. Bathroom: With bath with shower attachment and toilet. Third Floor: Bedroom 3: With single bed. Gas central heating, gas, electricity, bed linen, towels and Wi-Fi included. Travel cot and highchair available on request. Small enclosed courtyard with garden furniture. Permit parking for 1 car included. No smoking. Holidays at All Hallows Nave House run from Friday to Friday. For a better idea of where All Hallows Nave House is, you can see All Hallows Nave House on the map below. All Hallows Nave House is in Cumbria; should you be on the lookout for a special offer, you can find all the special offers in Cumbria. It's always worth checking to see what is on offer at the moment. Do you want to holiday near All Hallows Nave House (UK1123), you can see other cottages within 25 miles of All Hallows Nave House; have a look to find your perfect holiday location.